Advanced capabilities from GOES-16 and GOES-17 offer better detection of hazards associated with volcanic ash clouds. New flood products utilizing geostationary and polar-orbiting satellite data are helping forecasters better determine where and when flooding will occur. Operational Announcement GOES West Imagery Benefits for Western U.S.
GOES-17 will soon take its place as NOAA’s GOES West operational satellite. What is the GOES-R Series? 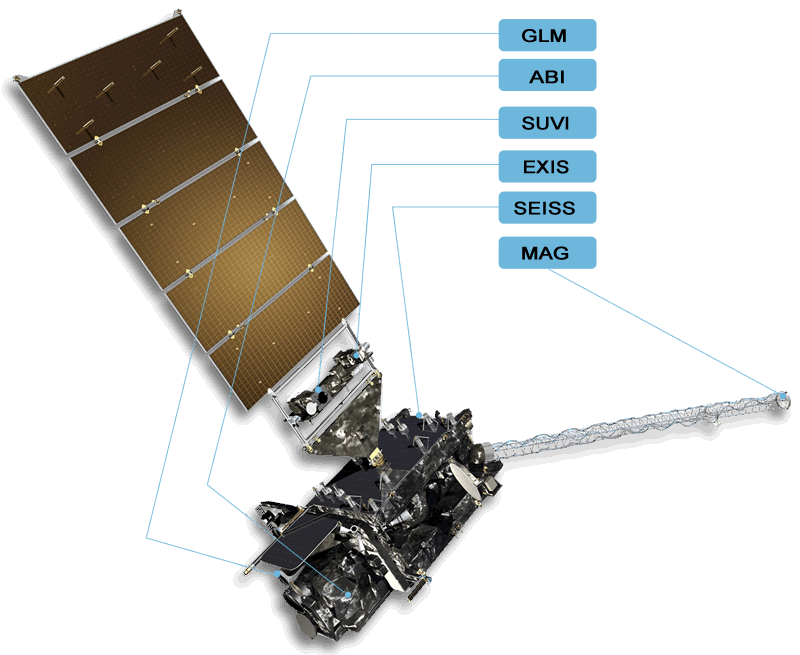 The Geostationary Operational Environmental Satellite (GOES) – R Series is the nation’s most advanced fleet of geostationary weather satellites. The GOES-R Series significantly improves the detection and observation of environmental phenomena that directly affect public safety, protection of property and our nation’s economic health and prosperity. The satellites provide advanced imaging with increased spatial resolution and faster coverage for more accurate forecasts, real-time mapping of lightning activity, and improved monitoring of solar activity and space weather. The GOES-R Series is a four-satellite program (GOES-R/S/T/U) that will extend the availability of the operational GOES satellite system through 2036. DCS is a satellite relay system used to collect information from Earth-based data collection platforms that transmit in-situ environmental sensor data from more than 20,000 platforms across the hemisphere. The Emergency Managers Weather Information Network (EMWIN) is a direct service that provides users with weather forecasts, warnings, graphics and other information directly from the National Weather Service (NWS) in near real-time. The HRIT service is a new high data rate (400 Kpbs) version of the previous LRIT (Low Rate Information Transmission), broadcasting GOES-R Series satellite imagery and selected products to remotely-located user terminals. The SARSAT system detects and locates mariners, aviators and other recreational users in distress. The GOES-R Series continues the legacy function of the SARSAT system on board NOAA’s GOES satellites. This system uses a network of satellites to quickly detect and locate signals from emergency beacons onboard aircraft, vessels and from handheld personal locator beacons. The GOES-R Series SARSAT transponder operates with a lower uplink power than the current system (32 bBm), enabling GOES-R Series satellites to detect weaker beacon signals. The GOES-R series spacecraft bus is three-axis stabilized and designed for 10 years of on-orbit operation preceded by up to five years of on-orbit storage. The spacecraft carries three classifications of instruments: nadir-pointing, solar-pointing, and in-situ. Visit the Spacecraft page of this site for more information. Explore the GOES-R series spacecraft: Use the quick view buttons above to swap the views of the spacecraft, watch the video below and use the Spacecraft & Instruments links below. A fly by in space of GOES-R. Note: there is no audio, therefore no closed captions. 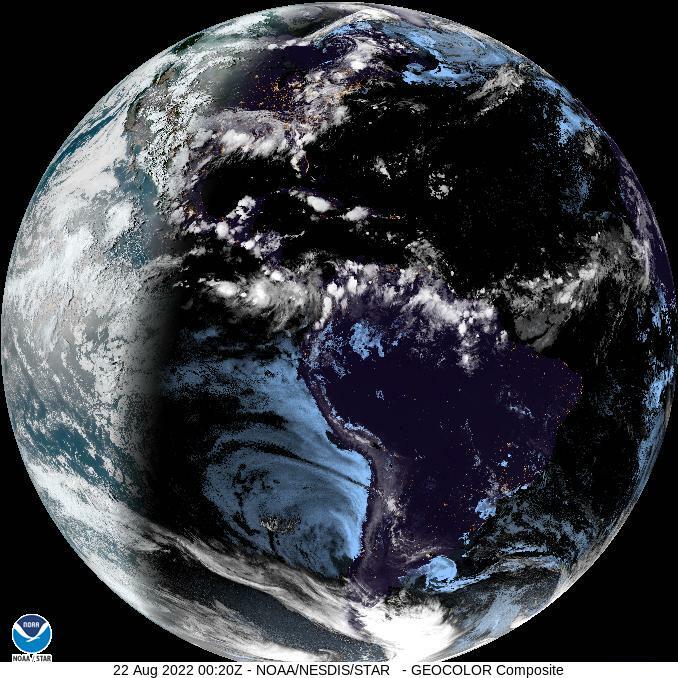 The most recent images of Earth's western hemisphere from the GOES constellation . Environmental satellites provide data in several different formats. The most commonly used channels on weather satellites are the visible, infrared, and water vapor. Visible satellite images, which look like black and white photographs, are derived from the satellite’s signals. Clouds usually appear white, while land and water surfaces appear in shades of gray or black. The visible channel reflects solar radiation. Clouds, the Earth's atmosphere, and the Earth's surface all absorb and reflect incoming solar radiation. Since visible imagery is produced by reflected sunlight (radiation), it is only available during daylight. In the infrared (IR) channel, the satellite senses energy as heat. The Earth’s surface absorbs about half of the incoming solar energy. Clouds and the atmosphere absorb a much smaller amount. The Earth’s surface, clouds, and the atmosphere then re-emit part of this absorbed solar energy as heat. The infrared channel senses this re-emitted radiation. Infrared imagery is useful for determining cloud features both at day and night. Water vapor imagery is used to analyze the presence and movement of water vapor moisture in the upper and middle levels of the atmosphere. The wavelength spectrum used to detect water vapor is in the 6.7 to 7.3 micrometer wavelength range. The darker regions in water vapor imagery are areas where very little water vapor exists in the middle and upper troposphere, and the lighter regions are very moist. Water vapor imagery is a very valuable tool for weather analysis and prediction because water vapor imagery shows moisture in the atmosphere, not just cloud patterns. This allows meteorologists to observe large-scale circulation patterns even when clouds are not present. The National Oceanic and Atmospheric Administration (NOAA) maintains two primary constellations of environmental satellites: geostationary and polar-orbiting. These satellites are part of NOAA's integrated observing system, which includes satellites, radar, surface automated weather stations, weather balloons, sounders, buoys, instrumented aircraft and other sensors, along with the data management infrastructure needed for this system. Geostationary satellites orbit 35,800 km (22,300 miles) above Earth's equator at speeds equal to Earth's rotation, which means they maintain their positions and provide continuous coverage. Information from geostationary satellites is used for short-term (1 day) weather forecasting and severe storm warning and tracking. Polar-orbiting satellites make regular orbits around the Earth’s poles from about 833 km (517 miles) above the Earth’s surface. The Earth constantly rotates counterclockwise underneath the path of the satellite, making for a different view with each orbit. Information from polar-orbiting satellites is used for mid-range (3-7 day) forecasts and advanced warnings of severe weather. GOES satellites continually view the continental United States, Pacific and Atlantic Oceans, Central and South America, and Southern Canada. To fully cover Alaska, Hawaii, the entire continental United States and the Pacific and Atlantic Oceans (for tropical storms), NOAA operates two GOES satellites simultaneously: GOES East and GOES West. GOES East is located at 75.2° W and provides most of the U.S. weather information. GOES West is located at 137.2°W over the Pacific Ocean. In addition to two operational satellites, NOAA also maintains an on-orbit spare. Since 1975, GOES have provided continuous imagery and data on atmospheric conditions and solar activity (space weather). They have even aided in search and rescue of people in distress. GOES data products have led to more accurate and timely weather forecasts and better understanding of long-term climate conditions. NASA builds and launches the satellites and NOAA operates them. GOES-R launched on November 19, 2016, and was followed by GOES-S on March 1, 2018. GOES-T was scheduled to launch in 2020 but will be delayed due to redesign of the Advanced Baseline Imager radiator. GOES-U is scheduled to launch in 2024. GOES-S, the second satellite in the GOES-R Series, launched on March 1, 2018, at 5:02 p.m. EST at the opening of the two-hour launch window. GOES-S launched from Space Launch Complex 41 at Cape Canaveral Air Force Station, Florida, aboard an Atlas V 541 rocket. The satellite was renamed GOES-17 when it reached geostationary orbit on March 12, 2018. GOES-17 joined its sister satellite, GOES-16, in orbit. The first satellite in the series, GOES-R, launched on November 19, 2016, and became GOES-16 when it reached geostationary orbit. GOES-16 replaced GOES-13 as NOAA’s operational GOES East satellite at 75.2 degrees west longitude on December 18, 2017. GOES-17 became the operational GOES West satellite at 137.2 degrees west longitude on February 12, 2019, replacing GOES-15. GOES satellites are placed into a geosynchronous orbit that keeps them over a specific location on the earth. By maintaining a position hovering over a fixed point on Earth's surface, GOES are able to constantly monitor atmospheric conditions in a particular portion of the Earth's atmosphere. Note that non-geosynchronous orbits (for example polar orbits) move over an ever-rotating earth underneath them, therefore seeing a constantly changing view, which has advantages for other types of missions. GOES-16 became operational as NOAA’s GOES East on December 18, 2017, replacing GOES-13. From its operational location of 75.2 degrees west longitude, GOES-16 is keeping watch over most of North America, including the continental United States and Mexico, as well as Central and South America, the Caribbean, and the Atlantic Ocean to the west coast of Africa. GOES-13 now resides in storage. GOES-14 will continue to be the on-orbit spare GOES satellite in the event of an anomaly or failure of GOES East or GOES West. Learn more about GOES-16’s transition to operations. View GOES-16 operational imagery via the GOES East Image Viewer. GOES-17 replaced GOES-15 as NOAA’s operational GOES West satellite on February 12, 2019. From its operational location of 137.2 degrees west longitude, GOES West is in position to watch over the western continental United States, Alaska, Hawaii, and the Pacific Ocean all the way to New Zealand. Due to a performance issue with the cooling system encountered during commissioning of the GOES-17 Advanced Baseline Imager (ABI) instrument, approximately 3% of ABI data is estimated to be lost due to the anomaly. GOES-15 will continue to operate alongside GOES-17 through early July 2019 to allow for assessment of the performance of GOES-17 as the GOES West operational satellite. GOES-15 drifted from its operational location at 135 degrees west longitude to 128 west to eliminate radio frequency interference with GOES-17 at 137.2 west. 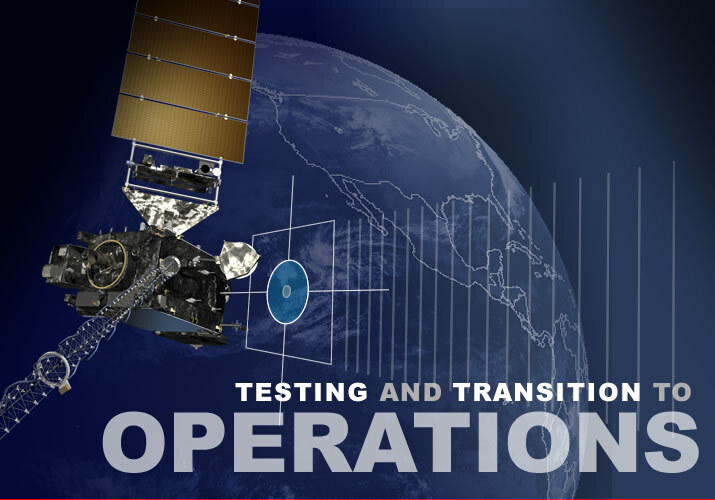 Learn more about GOES-17’s transition to operations. Learn more about cooling system issue and GOES-17 ABI performance. View GOES-17 operational imagery via the GOES West Image Viewer. 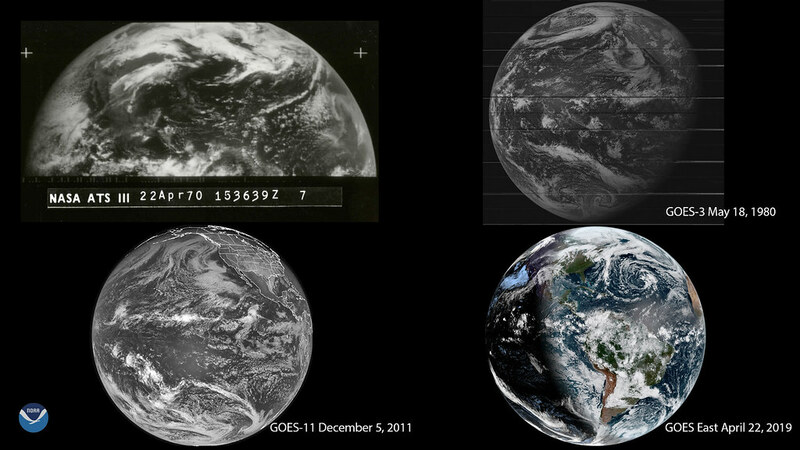 Earth from geostationary orbit as seen by NASA’s ATS III on the first Earth Day in 1970 (upper left), GOES-3 in 1980 (upper right), GOES-11 in 2011 (lower left) and GOES-16 on Earth Day 2019 (April 22). Earth Day was born from former Wisconsin Sen. Gaylord Nelson’s desire to bring environmental issues to the forefront of the national political agenda. The first Earth Day, held on April 22, 1970, was followed by the creation of the U.S. Environmental Protection Agency (EPA) as well as the passage of the Clean Air, Clean Water and Endangered Species Acts. Today, more than 1 billion people will participate in Earth Day activities, raising awareness about critical environmental issues. In celebration of Earth Day, we’re taking a look at just how far satellite imagery has come since 1970. NOAA celebrates Earth Day 2019. It’s that time again to reacquaint yourself with the health and well-being of our planet. We know what you’re thinking … but it’s not all bad news. NOAA scientists are using their expertise and innovation to help to solve Earth’s biggest challenges. 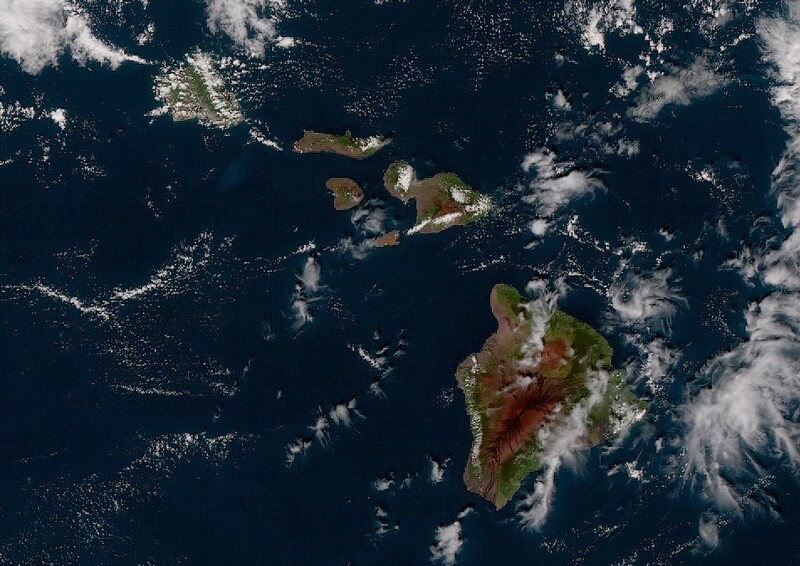 Check out NOAA’s list of useful, fun and fascinating feature stories to pique your interest during Earth Day week, including one on NOAA’s newest operational satellite, GOES-17! 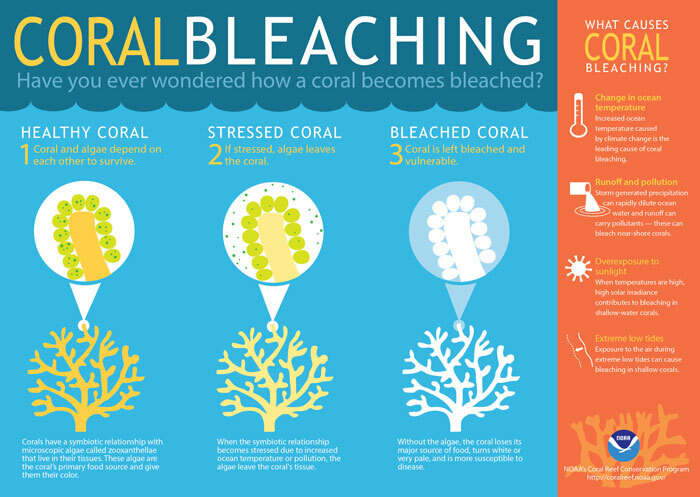 Coral reefs are one of the most productive and biodiverse ecosystems in the world. They cover an estimated 110,000 square miles of the ocean floor and are home to more than 25 percent of marine species for at least some part of their lives. As part of this year’s Earth Day theme, “Protect Our Species,” we’re looking at how NOAA’s satellites are monitoring the effects of climate change on coral reefs around the globe. Using a combination of NOAA and international partners’ satellites, Coral Reef Watch can monitor ocean temperatures and identify areas at risk for coral bleaching. The Advanced Baseline Imager (ABI) aboard the GOES-R satellite series and NOAA-20’s Visible Infrared Imaging Radiometer Suite (VIIRS) provide data on ocean temperatures by looking at the infrared radiation that’s emitted from the ocean. GOES-16 imagery of Hurricane Michael at time of landfall. Scientists at NOAA’s National Hurricane Center conducted a detailed post-storm analysis on all the data available for Hurricane Michael and have determined that the storm’s estimated intensity at landfall was 160 mph. This makes Michael a category 5 storm on the Saffir-Simpson Hurricane Wind Scale at the time of landfall on October 10, 2018, near Mexico Beach and Tyndall Air Force Base, Florida. Michael was the first hurricane to make landfall in the United States as a Category 5 since Hurricane Andrew in 1992, and only the fourth on record. 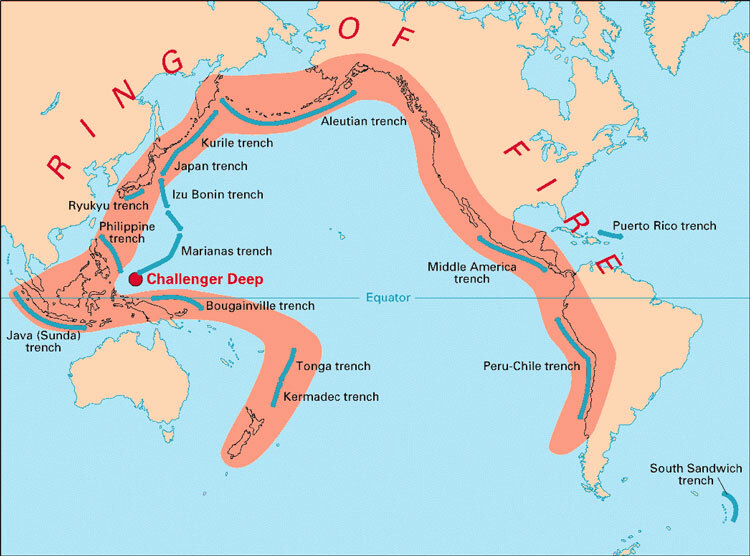 Volcanic ash is a significant health, aviation, infrastructure and economic hazard. GOES East and GOES West observe a significant fraction of the most volcanically active region on Earth, known as the “Pacific Ring of Fire.” New capabilities from the GOES-16 and GOES-17 Advanced Baseline Imager and Geostationary Lightning Mapper provide improved volcanic hazard forecasting and monitoring through sophisticated new data products and automated detection tools. As forecasters gain more experience with new GOES-R Series datasets, the value of the measurements will increase significantly, resulting in safer and more efficient air transportation and a better understanding of volcanic processes and the complex relationship between volcanic emissions and weather and climate. NOAA’s improved performance in understanding and predicting extreme weather and water events is critical. What does NOAA do for you? NOAA provides timely and reliable information based on sound science to communities and businesses every day. From daily weather forecasts, severe storm warnings, and climate monitoring to fisheries management, coastal restoration and supporting marine commerce, Americans rely on NOAA. GOES-16 and GOES-17 helped NOAA respond to extreme weather events in 2018 and contributed to improving NOAA’s observational infrastructure. View a story map version of NOAA’s 2018 Business Brief. GOES West water vapor imagery of bomb cyclone on March 13, 2019. The GOES-R Series Program quarterly newsletter for January – March 2019 is now available. GOES-17 is now operational as GOES West and we now have advanced geostationary satellite capabilities for more than half the globe. The program remains as busy as ever, with the team continuing to work on GOES-16 and 17 data product validation, the ground system server refresh, the GOES-T/U Advanced Baseline Imager cooling system redesign, and the build of our next two satellites in order to ensure continuity of GOES-R series operations for many years to come. The National Weather Service (NWS) is reporting an accelerated flood season across the Midwestern United States. On March 13, 2019, a winter storm system intensified and swept across much of the Central U.S., causing heavy rain, severe thunderstorms, snow, and blizzard conditions. The storm led to widespread flooding across parts of South Dakota, Nebraska and Iowa. New flood products, utilizing GOES-R Series and JPSS data, are helping forecasters better determine where and when flooding will occur and aiding officials in determining where to deploy resources during a flood event. 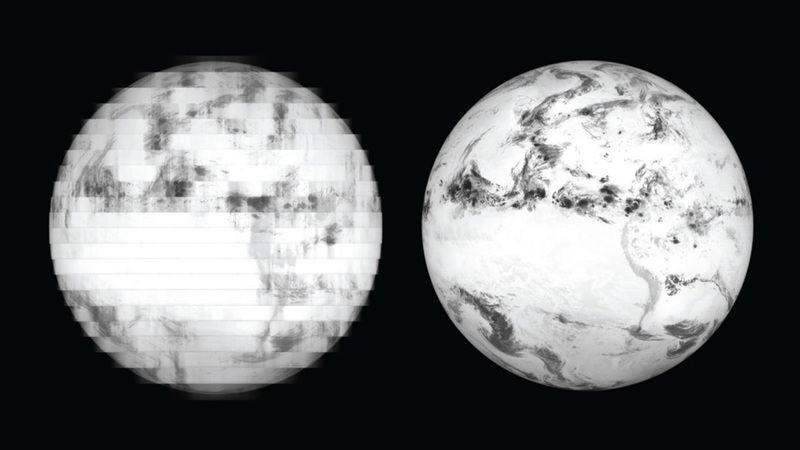 GOES-17 ABI elevated detector temperatures (left) resulted in blurred images. The GOES team solved the issue by adjusting the voltage that controls the flow of photocurrent (right). Aerospace America published an article “Saving GOES-17,” authored by John Van Naarden, Advanced Baseline Imager chief engineer at Harris Corp., and Dan Lindsey, NOAA’s senior scientific advisor to the GOES-R Program. 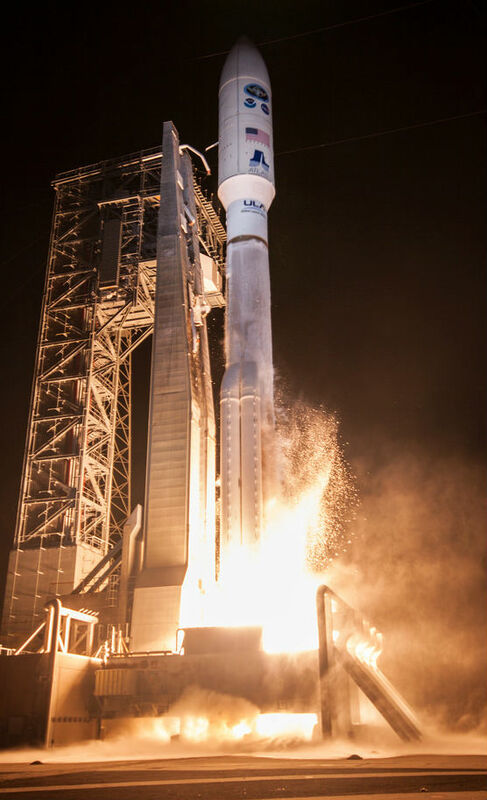 The article outlined the issues that were discovered with the cooling system on GOES-17’s primary instrument, the Advanced Baseline Imager, and efforts to improve performance of the instrument. Despite a thermal system operating at only about 5% of its capacity, ABI is now delivering more than 97% of its intended data, thanks to recovery efforts. GOES-16 Advanced Baseline Imagery (ABI) band 13 infrared imagery from 1345 to 1610 UTC on April 2, 2019. Ten-minute flex mode scanning with 10-minute full disk imagery started at 1600 UTC. On April 2, 2019, the GOES-16 and GOES-17 Advanced Baseline Imagers began operating in a new scan mode, 10-minute flex mode. Ten-minute flex mode is very similar to the previous default flex mode with one exception: a full disk image is generated every 10 minutes instead of every 15 minutes. Contiguous U.S. (CONUS) for GOES-16/ Pacific U.S. (PACUS) for GOES-17 scans (3000 km by 50000 km) are still provided every five minutes, in addition to two mesoscale domains (1000 km by 1000 km) every 60 seconds (or one domain every 30 seconds if scanning the same domain). The new scan mode allows NOAA to match the full-disk scanning cadence of our international partners and will be critical to National Weather Service Weather Forecast Offices, National Centers, and the Volcanic Ash Advisory Centers in monitoring hazardous weather conditions and providing additional information in observationally limited areas. NOAA’s 2019 Spring Flood Outlook map depicts the locations where there is a greater than 50% change of major, moderate or minor flooding March through May 2019. 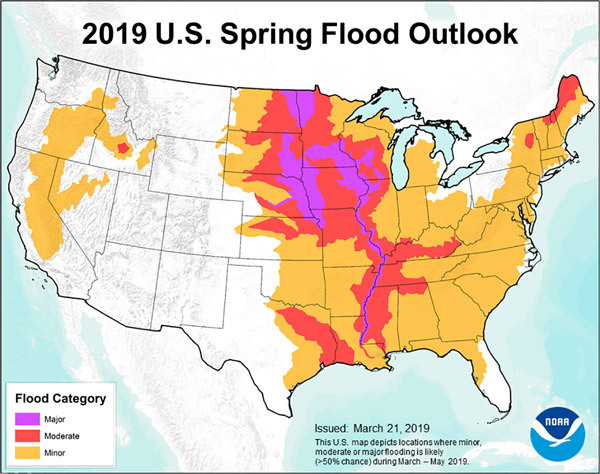 According to NOAA's spring flood and climate outlook, a wet winter has primed much of the Great Plains for spring flooding in 2019, with major flooding likely along the Red River of the North, the Missouri, and the Mississippi Rivers. Moderate flood risk extends upstream of those rivers to their tributaries, including the lower Ohio, the Cumberland, and Tennessee Rivers. Minor flood risk covers nearly the entire country east of the Mississippi as well as parts of Washington, Oregon, and California. Researchers are using satellite data to alert farmers and ranchers about impending flash droughts. Thermal infrared imagery from both the GOES-R Series satellites, as well as polar orbiting satellites like NOAA-20 and Suomi-NPP, is used to estimate evapotranspiration, which is a measure of how much water is being transferred from the land to the atmosphere through the soil and plants. 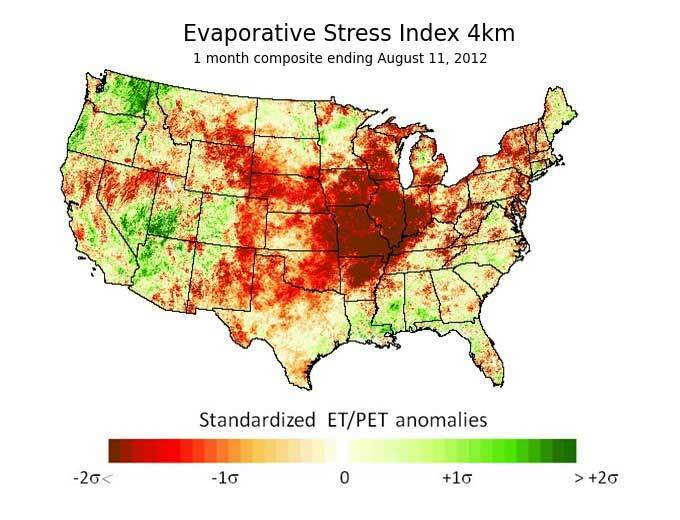 Using a tool called the Evaporative Stress Index (ESI), it’s now possible to deliver a probabilistic forecast, like the ones we get from the National Weather Service, a month or so ahead of the onset of a flash drought. New tools and better forecasts give the agricultural sector even more options to deal with drought and can help mitigate their future impact. 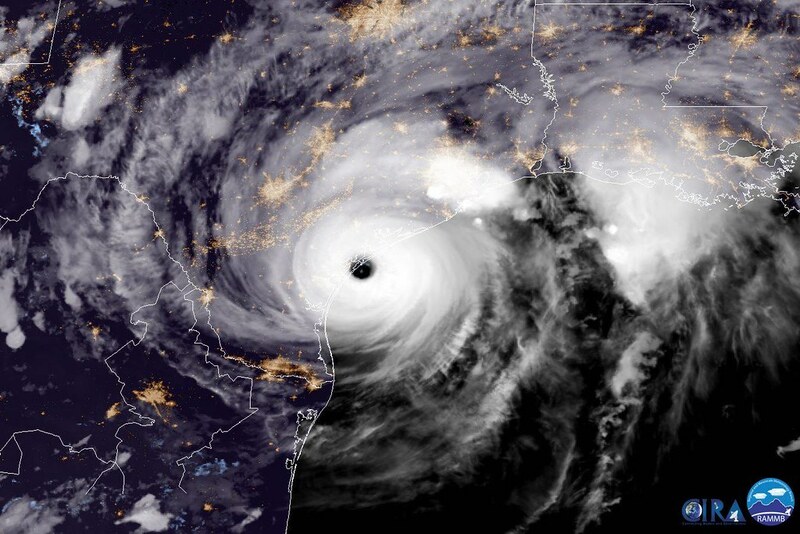 GOES-16 image of Hurricane Harvey approaching the Texas Coast, featured in the 2018 NOAA Science Report. The 2018 NOAA Science Report is now available. The report highlights NOAA’s research accomplishments and the vital service’s the agency provides to Americans every day. The science report spans the entire range of NOAA’s mission, and the 72 stories featured in this year’s report represent a selection of NOAA’s research and development accomplishments. The GOES-R mission is highlighted in several areas of the report, including the GOES-S (17) launch, lightning detection, solar imaging and space weather monitoring, fire detection and monitoring, flood mapping, and hurricane tracking. 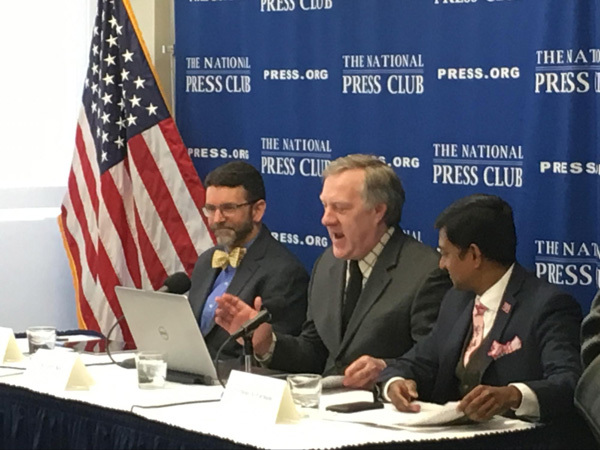 From left, Jeremy Gregory, Ph.D., Gerry Bell, Ph.D, and moderator Ferdous Al-Faruque at the National Press Club on March 5, 2019. Each year, NOAA helps the United States prepare for hurricanes by issuing a seasonal outlook before the official start of the season on June 1. Gerry Bell, Ph.D., from NOAA’s Climate Prediction Center, spoke to reporters at the National Press Club on March 5 about how NOAA creates this outlook and the climate drivers that fuel or suppress a hurricane season. Bell said the Atlantic remains in a period of increased hurricane activity that began in 1995 and generates more, stronger, and longer-lived storms. Bell also identified several global climate patterns that can drive hurricane development within that high-activity era. The Atlantic Multi-decadal Oscillation (AMO) influences hurricane seasons over several decades and the El Nino/Southern Oscillation (ENSO) drives year-to-year variability. “By predicting key climate patterns, we can often predict these regional hurricane-controlling conditions, and therefore predict the strength of the upcoming hurricane season,” he said. The North Pacific Jet (NPJ) travels eastward at variable wind speeds and directions toward California at an altitude of about 11 kilometers above the ocean’s surface. The strength and position of the winds take on importance in relation to the amount and intensity of moisture the jet stream delivers. This graphic represents a winter-average path of entry to California that could produce a very-wet, low-fire season in the state. Courtesy of NOAA NCEI. Deadly severe wildfires in California have scientists scrutinizing the underlying factors that could influence future extreme events. Using climate simulations and paleoclimate data dating back to the 16th century, a recent study looks closely at long-term upper-level wind and related moisture patterns to find clues. New research published by the Proceedings of the National Academy of Sciences USA examines jet stream and moisture patterns in California over a centuries-long time period—1571 to 2013. The work provides a stronger foundation and a longer-term perspective for evaluating regional natural hazards within California and the economic risks to one of the world's largest economies. Atmospheric rivers are long, narrow conveyor belts of moisture that move through the atmosphere. Strong atmospheric rivers can deliver enormous amounts of rain and high-elevation snow in California, Pacific Northwest, and Alaska, especially during the winter months. The GOES-R Series Advanced Baseline Imager provides improved detection and monitoring of atmospheric river events. Understanding and anticipating the role of atmospheric rivers is important for water and emergency management on the West Coast, particularly in California. GOES-17, recently designated NOAA’s GOES West operational satellite, is positioned to keep an eye on the western U.S., Alaska and Pacific Ocean, and provide advanced monitoring of atmospheric rivers among other weather phenomena and hazards. 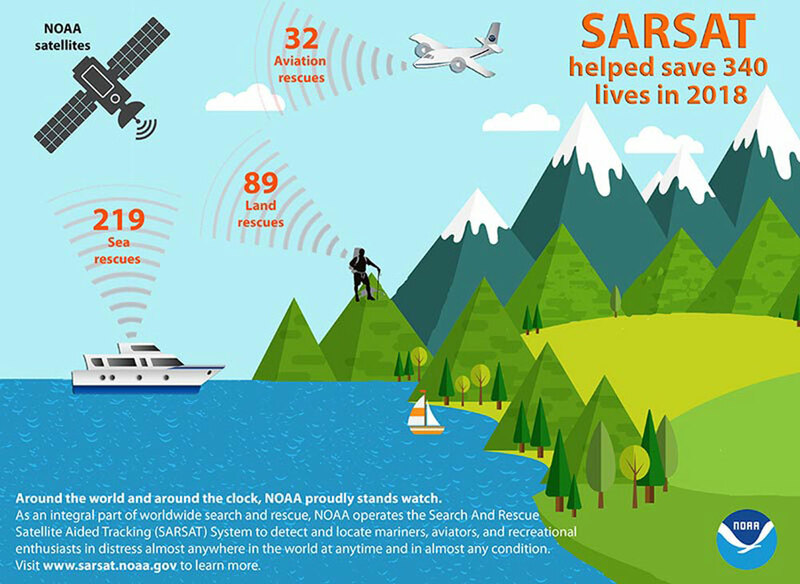 In 2018, the NOAA Search and Rescue Satellite Aided Tracking (SARSAT) system helped save 340 lives with the aid of NOAA satellites like GOES-16. In addition to carrying instruments for monitoring our atmosphere, land and oceans for severe weather and other hazards, GOES-16 also carries a SARSAT transponder to help locate people in distress. This transponder provides the capability to immediately detect distress signals from emergency beacons and relay them to ground stations. In turn, this signal is routed to a SARSAT mission control center and then sent to a rescue coordination center, which dispatches a search and rescue team to the location of the distress. February 12, 2019: GOES-17 is Now Operational as NOAA’s GOES West! GOES-17 is now operational as NOAA’s GOES West! GOES-17 is now operational as NOAA’s GOES West. In its new role, GOES-17 is providing faster, more accurate, and more detailed observations for detecting and monitoring Pacific storm systems, fog, wildfires, and other weather phenomena that affect the western United States, Alaska, and Hawaii. Located at 137.2 degrees west longitude, GOES-17 replaces GOES-15 as NOAA’s operational GOES West. GOES-17 joins GOES-16, in operations as NOAA’s GOES East, in delivering high-resolution visible and infrared imagery and lightning observations of more than half the globe – from the west coast of Africa to New Zealand and from near the Arctic Circle to the Antarctic Circle. View GOES-17 operational imagery. For the globe, 2018 became the fourth warmest year on record and the United States experienced 14 billion-dollar weather and climate disasters. These are findings from the 2018 Annual Global Climate Report from NOAA National Centers for Environmental Information, which is part of the suite of climate services NOAA provides to government, business, academia and the public to support informed decision-making. Earth’s long-term warming trend continued in 2018 as persistent warmth across large swaths of land and ocean resulted in the globe’s fourth hottest year in NOAA’s 139-year climate record. The year ranks just behind 2016 (warmest), 2015 (second warmest) and 2017 (third warmest). In separate analyses of global temperatures, scientists from NASA, the United Kingdom Met Office and the World Meteorological Organization also reached the same heat ranking. Shadow of the moon as it passes in front of the sun on February 5. GOES East captured a partial solar eclipse on February 5, 2019. In this animation from the satellite’s Solar Ultraviolet Imager (SUVI) instrument, you can see the moon passing across the sun. A partial eclipse occurs when the sun and moon are not exactly in line with the Earth and the moon only partially obscures the sun. Meteor over Cuba captured by the GOES-16 GLM instrument. On February 1, 2019, at 1:17 p.m. EST, the GOES-16 Geostationary Lightning Mapper (GLM) detected a bright meteor over northwestern Cuba. The meteorite landed near Viñales, Pinar del Río in western Cuba. While designed for mapping lightning flashes, GLM can observe large meteors anywhere throughout its coverage area. The instrument takes 500 images of Earth every second, allowing it to measure the shape of a meteor “light curve,” or the change in brightness of a meteor with time, with millisecond precision. The GOES-16 Advanced Baseline Imager also detected the airborne debris cloud as it drifted northeastward then eastward for about an hour after the impact. The signatures in the split cloud top phase and split window imagery were due to the presence of mineral dust particles within the debris cloud — the emissivity properties of dust affects the sensed brightness temperatures differently for various infrared spectral bands. The cirrus spectral band is useful for detecting the scattering of light by airborne particles such as ice crystals, volcanic ash, smoke or dust. The debris cloud was also casting a subtle shadow onto the surface, as seen in the visible imagery. The GOES-R Series Program quarterly newsletter for the time period October – December 2018 is now available. GOES-17 completed its Handover Readiness Review and the program handed the satellite over to NOAA’s Office of Satellite and Product Operations. GOES-17 is now in its operational location at 137.2 west and is providing stunning imagery of the U.S. West Coast, Alaska, Hawaii, and even New Zealand. The satellite is ready for operations as NOAA’s GOES West. This conference merges three satellite conferences into one major event. NOAA, the American Meteorological Society (AMS) Satellite Meteorology, Oceanography, and Climatology (SatMetOC), and the European Organisation for the Exploitation of Meteorological Satellites (EUMETSAT) will hold a joint conference September 29 – October 4, 2019, in Boston. Abstract submissions are due on March 1, 2019.